A little something for the kitty lovers out there. This is a great item for kitties who love to scratch. This set comes with a 17x9 frame, two cat scratchers, cat nip, and a cat toy. I love that this can be used either hanging or laying flat on the floor. Kitties all seem to have their own preference. The neat thing about this is that you can actually get 4 uses out of it by flipping each over when the other side is scratched up. For new kitties I suggest sprinkling a little cat nip on the cardboard to get them used to scratching this and not your precious furniture or curtains. My readers can get 15% with code G3J7S858 *code subject to expire, end, or change at any time. 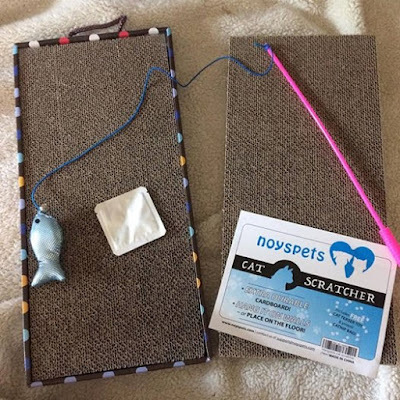 The NoysPets cardboard cat scratch box can be found at my affiliate link below. Disclosure: MarksvilleandMe received one or more of the products mentioned above as part of a promotion with Tomoson and NoysPets. Regardless, MarksvilleandMe only recommends products or services we use personally and believe will be good for our readers. Some of the links in the article may be “affiliate links.” This means if you click on the link and purchase the item, I will receive compensation. If you would like MarksvilleandMe to review a product or service please contact us at marksvilleandme@gmail.com.